Everything tastes better when cooked over an open fire. Even a botched upside-down cake. Everyone in the group declared it the best cake for miles around — not hard to accomplish on a sandbar in the Wisconsin River. 1) At home cut 2 pieces of HEAVY-DUTY aluminum foil big enough to line the inside of your dutch oven. Triple fold a seam to connect the two sheets of foil. The foil makes clean up a breeze. 2) Assemble ingredients: A yellow cake mix (a two-layer mix, if you like more cake; one layer mix, for less cake),a 16 oz. can of pineapple, a can of diet Sprite or 7-up (or use water), optional egg, 1/2 cup brown sugar, 9 cherries (I used cherry-flavored craisins). A large zip lock bag. 3) Build a good-sized fire to create hot coals. 4) Press foil into dutch oven. Put the lid on to tear off excess foil. 5) Heat pot in fire while mixing cake mix. In zip lock bag blend cake mix, optional egg, juice from pineapple and enough Sprite or water to create a creamy batter. Knead bag until all lumps and dryness disappear. 6) Spread brown sugar in the bottom of Dutch Oven. 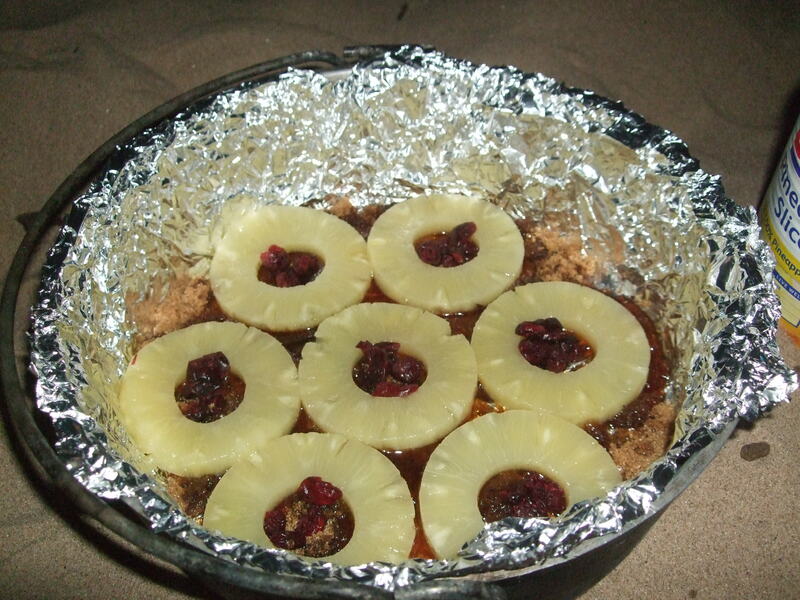 Arrange pineapple slices on top of sugar, putting cherries/craisins in pineapple centers. I used one layer, but next time I will use all slices in the can. 8) Put the Dutch oven on hot coals and add coals to the lid. We’re aiming for 350 degrees. Put an evenly spaced ring of red-hot coals under the pot and a greater number on the the lid. Turn the pot every ten minutes or so. Replace coals as they die out or turn to ash. Avoid lifting the lid so the cake won’t fall. Check cake after 25 -30 minutes. It should spring back when pressed with your finger. 9) Place a cookie sheet or large plate over the oven and flip the pot over so the cake is inverted onto the plate. Remove foil and enjoy. Here’s where my first attempt went wrong . . . 1) I used regular tin foil which was too thin and stuck to the bottom, making clean up a mess. 2) I brought along oil, but didn’t need it. 3) I should have used all the slices of pineapple in the can. 4) We didn’t have quite enough coals, so baking time was longer. 5) We had nothing to turn the cake out onto, so we scooped it out. It wasn’t pretty, but it was delicious. As I said, everything tastes great when cooked over an open fire. . . even a botched pineapple upside-down cake. Yum. Tell me about your edible failures.